I'm back with another piece of embellished clothing! Just as in my post from last week, entitled Embellishments Make Me Blush, this sweater features insects. This time around, however, the insects are these adorable, rhinestone bees. Regarding actual insects, which I usually find to be more deplorable than adorable, today I found a spider that was crawling on my desk in my classroom. While I don't actually have a particular fear of insects, even spiders, I do see them as unnecessary burdens: insects often bite you, destroy your plants, or, as in the case of this classroom spider, cause students to lose focus. Due to the pleas of my students, I removed the aforementioned spider from my classroom in the most humane way possible: I scooped it up on a piece of paper and released it back to the wild. It was my good deed for the day! I was very excited to snag this bee sweater, even if I paid close to full price for it, since it was one of those items that sold out quickly from the J. Crew website. Although the sweater quickly sold out when it was first released, it does pop back up from time to time. The best time to take advantage of items popping back from places like J. Crew is to look at the company's websites late at night when old items become available. Luckily for me, I'm somewhat of a night owl, so I can take full advantage of the opportunity to get items that momentarily come back in stock. As brief side note, I am pretty excited that these photos actually make it look like I live in a place where we have seasons such as fall. 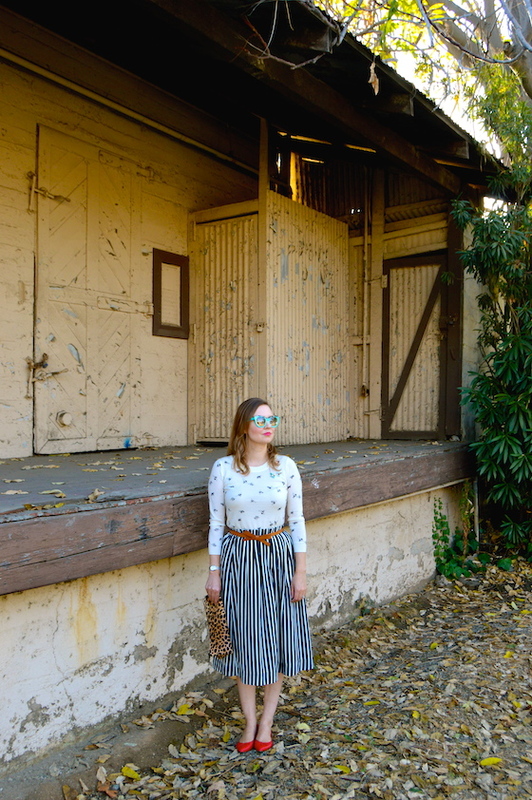 In my quest for an ideal blog location, my husband and I happened upon this old citrus packing house . I love exploring and finding hidden pieces of L.A.'s past while blogging. There's definitely something new to discover around every corner, although hopefully it won't be a scary spider! Love the sweater and the location. Such a great look. Your sweater is the absolute cutest, love the embellishments! This combo is just adorable! I pretty much love any pattern mixed with leopard. What a great print for a shirt!! 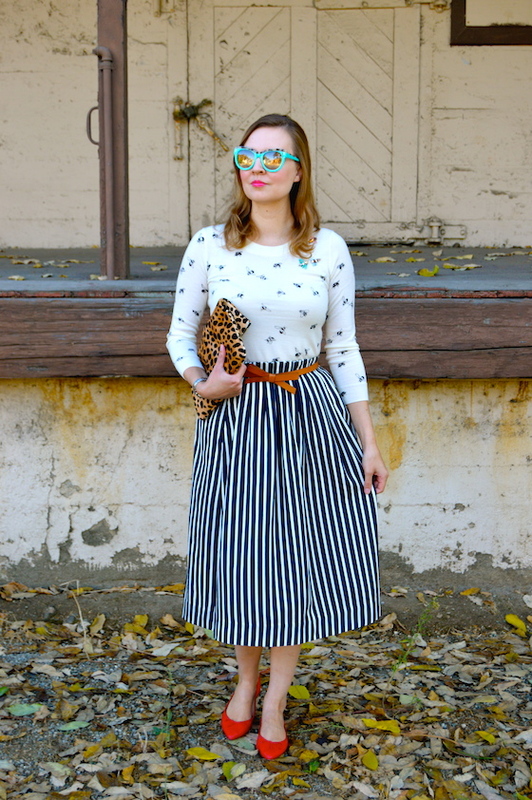 I love the print mixing you did with it! I LOVE this sweater! And those two little jeweled bees are adorable! Love that skirt too! 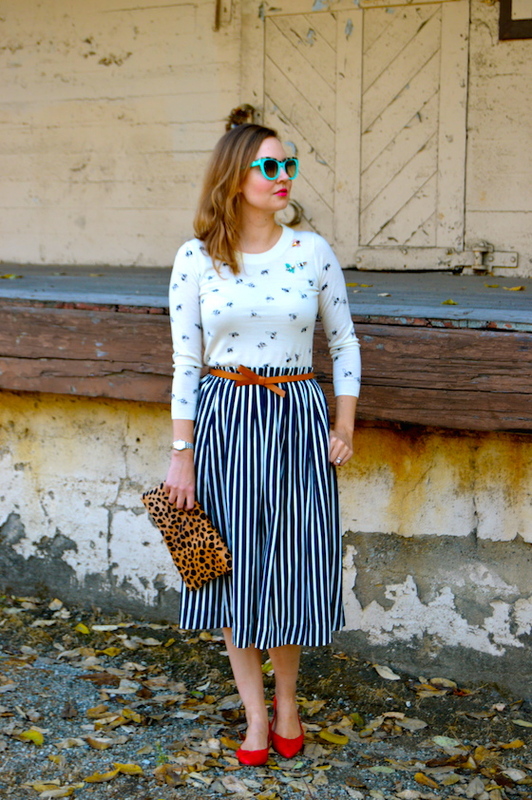 I like how you put two very bold pieces together and wore them perfectly! Such cute details!! What a fun and different sweater for fall! That top is so adroable, what a nice fun print. this is so cute! I love that top! You always have the greatest and most creative looks! I love your bumble bee sweater, it is so cool! Love love love this look! everything head to toe! Adorable sweater and so perfect with your striped midi skirt. Cool locale for photos, too. Thanks so much for linking up with Fabulous Friday!